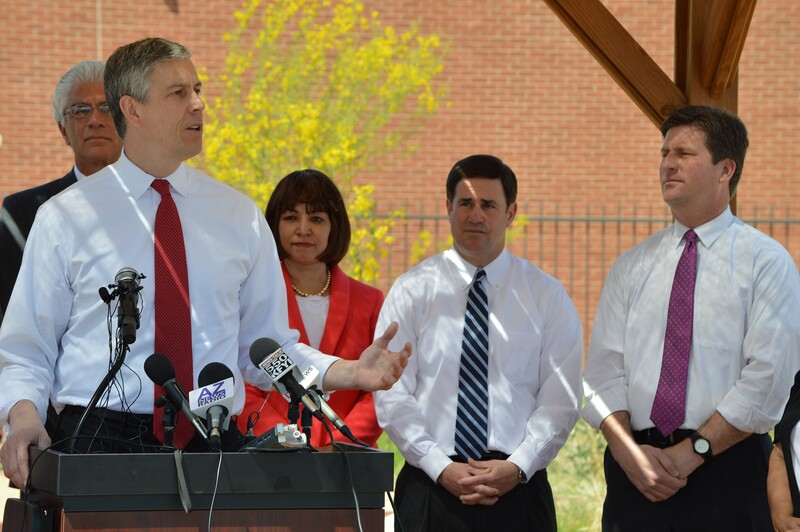 As Duncan pitches education in Phoenix, reform bills inch forward in D.C. Investing in early childhood development reduces the dropout rate, teen pregnancy and prison costs while producing a better-educated workforce, U.S. Secretary of Education Arne Duncan said Tuesday. “Wherever I go, there is huge, huge need,” Duncan said after visiting an inner-city school district’s early childhood education center. But too often that need goes unaddressed because states don’t provide programs that prepare children for school, he said. “Thousands of children whose parents want them to have the opportunity to enter kindergarten ready and prepared but are denied that simply because they don’t have those opportunities – there is something fundamentally unfair and unjust about that,” Duncan said. Duncan joined Gov. Doug Ducey to visit the Roosevelt School District’s Martin Luther King Jr. Early Childhood Center and met with representatives of groups with a stake in education to discuss the need for high-quality preschools. The center will benefit from a federal Preschool Development Grant providing Arizona with $20 million to develop preschool programs benefiting families with low and mid-level incomes. It will add 133 classrooms serving 3,478 children in 15 communities by 2018, according to the U.S. Department of Education. Duncan said the need to improve early childhood education is among the reasons the Obama administration wants Congress to revamp No Child Left Behind to better prepare children for college and careers, protect historically underserved populations and give educators more resources. Debbie Everett, principal of the Martin Luther King Jr. Center, said the school has a long waiting list and that 50 percent of the students have identified special needs, which stretches resources thin. The school, which is partly funded by the federal Head Start program and Arizona’s First Things First program, received at least $300,000 this year from the federal Preschool Development Grant, Everett said. U.S. Secretary of Education Arne Duncan says investing in early childhood development reduces the dropout rate and prison costs while producing a better-educated workforce. He was in Phoenix on Tuesday touting high-quality preschool education. U.S. Secretary of Education Arne Duncan speaks at a news conference in Phoenix on a visit in which he toured an inner-city school district’s early childhood education center and met with state and local officials.